When food coloring and soap are added to whole milk, strange things happen. Will the same thing happen with kinds of milk that have different fat contents? Do not drink the milk once it is used for this activity! Soapy milk is not delicious or good for you. It is helpful to have multiple plates with milk ready to go. For example, start with a 2% milk plate and have a whole milk plate prepared and nearby to do next. When you first do the experiment, try to keep the toothpick or cotton swab as still as possible to see the full effects. You can move it around later and see what changes! Pour some milk into the bottom of your container. You do not need a lot of milk, just enough to cover the bottom, plus a little extra. Drop different food coloring colors into the milk, as much or as little as you want. Pour dish soap into your small bowl. Dip your toothpick or cotton swab into the dish soap to coat it. Bring it over to the milk dish, and put the tip into the milk. Try to hold the toothpick or cotton swab still. You can move it later. Observe and discuss what happens. Try the experiment again using different types of milk. Observe and discuss what happens! Once you try the experiment with whole milk, try it with another kind of milk or other liquids. Observe and talk about what happens! Heavy cream has the highest fat content, but because it is so thick the reaction is slow! You needed to keep the toothpick or cotton swab very still for the initial part of the experiment. Now try moving it around and see what happens! What do you think will happen when we drop food coloring into the milk? What do you think will happen when we put the soap into the milk? What do you think will happen when we use a different kind of milk? What will be the same? What will be different? 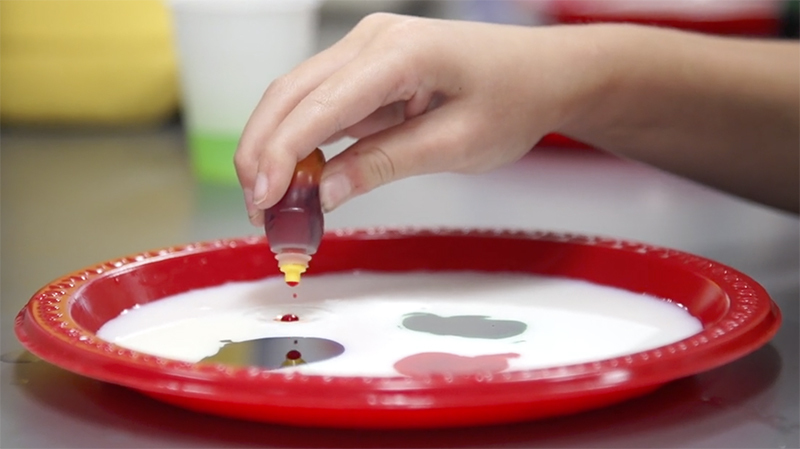 What do you notice about how the food coloring drops look in the different varieties of milk? Usually, the higher the fat content, the smaller the drops of food coloring appear. Try it, what do you observe? Try the same kind of milk with food coloring drops again. What happens when you hold the soap covered cotton swab in one place in the dish? What do you notice? You should notice some “waves” of color moving across milk with higher fat contents. See the How It Works section to find out why! What other kinds of liquids could we try this with? What happens in water? What about olive oil? What happens if we try this with different brands of dish soap? What happens when you put a lot of soap into the milk on the plate? You are observing chemistry in action! There is a reaction happening between the soap and the milk fat. Milk is made up of vitamins, minerals, proteins, and fats. 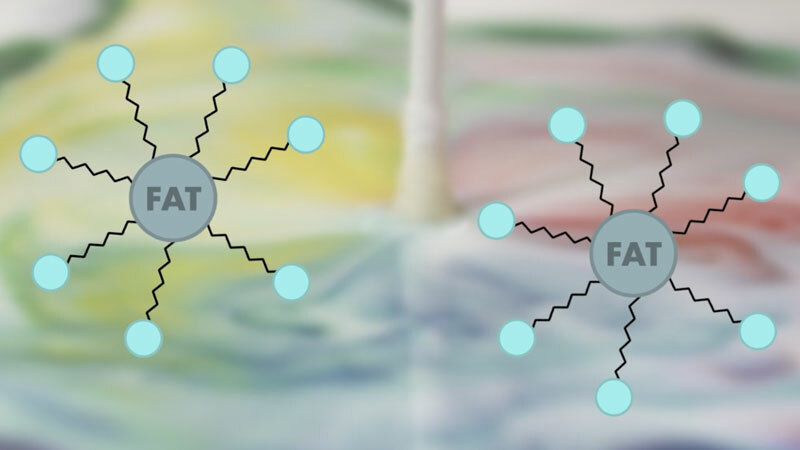 Soap is really good at breaking down fats - think about how it helps get cooking grease off of dishes! When soap is introduced to milk, the soap molecules chase down the fat molecules and surround them, forming little balls called micelles. This movement breaks the surface tension of the milk and causes movement, which mixes the colors. The higher the fat content of the milk, the more fat molecules the soap have to find. You should see more movement in higher fat versions of milk. Caused by the attraction between molecules, a force that creates a layer on top of liquids (creating a way for insects to walk on water for example). Compounds found in foods that are necessary for the healthy functioning of our bodies. A nutrient found in some food (such as meat, milk, eggs, and beans) that is made up of many amino acids joined together, is a necessary part of the diet, and is essential for normal cell structure and function. A nutrient found in some food that the body uses as a fuel source and major storage form of energy in the body. A mix of molecules that forms in certain colloid solutions such as soap. A substance microscopically dispersed evenly throughout another substance.